Charlie Bears Cordelia Discounts Apply ! Designed by Isabelle Lee for Charlie Bears 2018 Happy Ever After Collection. Hi all I am Cordelia, One of the Sailors in a Collection of 4 sailors and Pirate Minimo (The water Babies). 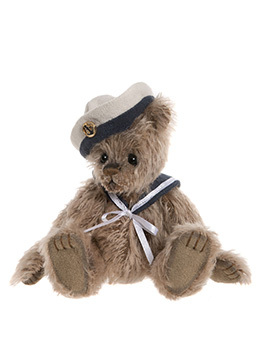 I am Made from beige Sparse mohair Dressed in a Cute Sailors Outfit I have a hand stitched nose and little stitched paws. Her Mates are Kendra Barnacle and Dubloon. This is a collectors item and not suitable for under 14 years of age. Surface wash with care. Comes with a Numbered Certificate of Authenticity Attached & FREE Limited Edition Charlie Bears Cotton Canvas Bag.